The town marshal of Yellow Sky goes to San Antonio to meet and marry his wife. He is on the train making his way back with his new wife but is a bit nervous about what the folks of Yellow Sky will think because he made no mention of this. So nervous, he is blind to the derision that other people on the train have for him. While the train races to Yellow Sky, the folks at the Weary Gentleman take cover as Scratchy Wilson goes on a shooting spring outside in dire search of the marshal. They talk about how Scratchy is the town drunk and wants a rematch against the marshal. He keeps yelling for the marshal but never encounters him so he decides to try to go to the marshal's house. When the marshal arrives in Yellow Sky, he proceeds to his house with his new bride in hopes of avoiding anyone he might know. He arrives at home at the same time that Scratchy does and is confronted by the drunk man. The marshal stands down and says he won't fight Scratchy because he doesn't have a gun on him and he is married. Scratchy is baffled by this and eventually, seeing the bride gives up and goes home. 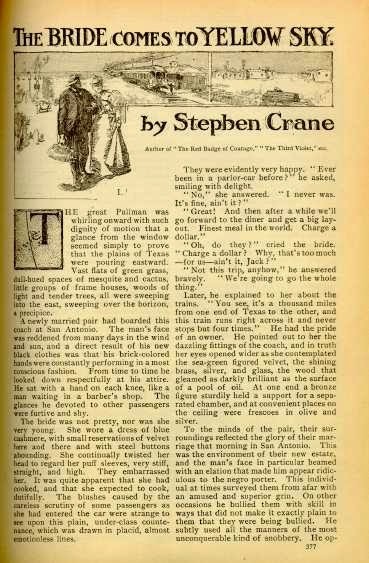 Compared with other stories by Crane which tend to be dark and harsh ("The Monster" and "The Dark Brown Dog" come to mind), this story has a much lighter touch to it but still speaks to adult themes of moving on and facing on adulthood. It's more humor than I generally associate with Stephen Crane.